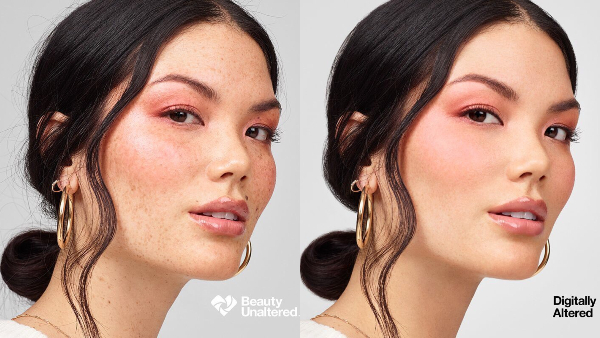 A year after announcing its decision to bring more transparency to its advertising through anti-retouch ‘Beauty Marks’, major drugstore CVS Pharmacy has officially rolled out its first images for real-world brands in stores. Unedited imagery will be labeled with a special ‘Beauty Mark’ watermark to let shoppers know if a brand has been honest with its advertising of a person’s appearance. “We want our beauty aisle to be a place where our customers can always come to feel good, while representing and celebrating the authenticity and diversity of the communities we serve,” CVS says. The first phase of the program boasts airbrush-free adverts by a trio of prominent beauty brands under its belt: Neutrogena, Covergirl, and Revlon have all committed to this refreshing campaign. By end 2020, they will be joined by Aveeno, Olay, Revlon, Almay, Maybelline, Rimmel, Unilever, and L’Oreal. Check out some early photos for the ‘CVS Beauty Unaltered’ campaign, which are modeled by Neutrogena spokesperson Kerry Washington, Covergirl ambassador Ayesha Curry, Revlon spokeswoman Ashley Graham, and more below.